The Model 3, once touted as Tesla's $35,000 car for the masses, can now set a buyer back almost $80,000. Tesla CEO Elon Musk unveiled specifications for a faster and more powerful version of the Model 3 in a series of tweets over the weekend. 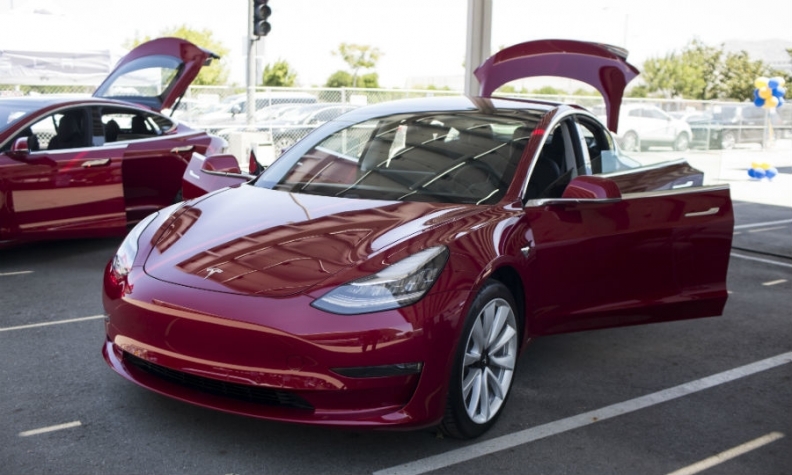 It will cost $78,000, more than double the $35,000 base-model starting price discussed into the run-up before the electric car's deliveries started last year. And that doesn’t include the Autopilot driver-assist feature. The performance Model 3 will have a 310-mile (500 km) range, and accelerate from a standstill to 60 mph (97 kph) in 3.5 seconds. For $78,000 excluding an autopilot option, customers can push the vehicle to a top speed of 155 mph (255 kph), Musk said on Twitter. Deliveries will begin in July, he said in tweets posted Sunday. The cost is about the same as a BMW M3, "but 15 percent quicker and with better handling," Musk said. The car "will beat anything in its class on the track," he said. It will also be available with black and white interiors. According to BMW's website, a BMW M3 sedan has a starting manufacturer’s suggested U.S. retail price of about $66,500. The increasingly expensive configurations for the Model 3 are planned steps, if somewhat counterintuitive ones, toward Musk’s vision of Tesla as a mass-production player with vehicles affordable to a broader swath of buyers. The $78,000 sticker puts the electric sedan beyond reach of many consumers, and, by Musk’s own estimations, brings it closer to the realm of luxury cars. "A Model 3 with a $35,000 price will be the rarest of the rare," said Kevin Tynan, a Bloomberg Intelligence analyst. "Perhaps the second most collectible Tesla ever, behind the one floating around in space.”"
Musk’s latest tweets build the hype around a car that has faced repeated production delays and manufacturing bottlenecks, which the company is just starting to clear. Tesla delivered 8,180 of the sedans in the first quarter, making it the best-selling electric car in America, and almost a half-million people have put down $1,000 deposits for Model 3s. When Model 3 deliveries started last July, Tesla described the $35,000 price for a Model 3 with a standard battery with a 220-mile range before options or incentives. But its focus was on fulfilling orders for customers who wanted longer-range battery packs with faster charging, pushing the price up to about $44,000. Tesla said in February a dual motor version would come at midyear and a standard battery pack would be available in late 2018. In a letter to shareholders earlier this month, Musk said that the company would begin offering new options such as all-wheel drive -- and a base model with a standard-sized battery pack -- once his factory in Fremont, California, reaches a production rate of 5,000 cars a week. Only the expensive performance model was mentioned in Musk's tweets this weekend. The company’s current business model and financial position -- it's operating at a loss and has negative operating cash flow -- mean "that this is not the time for a $35,000 Model 3," Bloomberg Intelligence's Tynan said in emailed comments. The pricey version of the Model 3 is in keeping with Musk’s earlier practices with the Model S luxury sedan and Model X SUV -- adding options and higher specifications to help generate cash that can be used to eventually build vehicles for mainstream buyers. Shipping a minimum-cost Model 3 right away "would cause Tesla to lose money and die," Musk said on Twitter. The company needs three to six months after achieving production of 5,000 units a week before it can ship a $35,000 Model 3 and survive, he said. Tesla burned through more than $1 billion of cash in the first quarter and may need to tap capital markets for more than $10 billion by 2020 to fund its car-making operations, new products and expected expansion into China, Goldman Sachs Group analysts said last week. Mounting liquidity pressures and challenges with Model 3 production prompted Moody’s Investors Service to cut the carmaker’s credit rating further into junk status in March, adding fuel to a sell off of the company’s bonds to all-time lows. For every additional thousand dollars that ends up being added to the price of Model 3, the size of the U.S. auto market that buys cars that are that expensive shrinks by 1 percent to 2 percent, according to Kelley Blue Book. That’s a trade off the company is willing to make. The profit is in the higher trims, Ivan Drury, senior manager of industry analysis at Edmunds.com, said. "The idea that it’s supposed to be a car for everyone is kind of laughable," Drury said. "Anyone who wanted a base model may have to wait years out."